Category Archives: Am I grown up yet? I thought I posted this early last week. As it turns out I left it as a draft and didn’t get to posting … so here it is. As the old adage goes, ‘If life gives you lemons make lemonade’. Basically if you experience something horrible and sour then turn it into a positive and sweet experience. So here I was last night feeling sorry for myself and unable to think clearly enough to make any sense of complex PhD content. 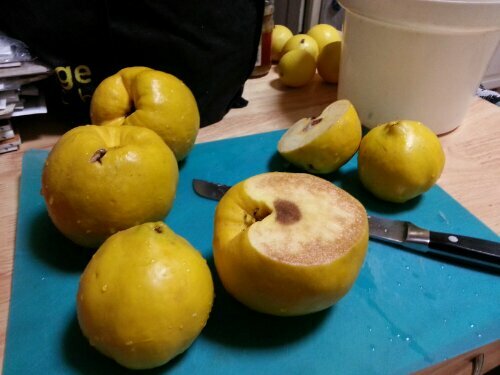 I just happened to have quinces thanks to a neighbour of the house I am housesitting (just another part of my life) so I did what I could do – cook. When I moved into this house a few weeks ago the instruction note I was left included “…and do something with the quinces”. My first thought was “what on earth would I do with quinces!”. Last night was the night I decided to work that out. On to Google I went and simply searched ‘quinces’. I had thought about jam or jelly/paste but figured I wouldn’t have enough for that. Ha! Boy was I wrong. Only 4-5 is needed for a jar or two of jam and a heap of jelly. Clearly I have never done anything with quinces before but I knew quince jelly was a sweet taste sensation that goes wonderfully with crackers and cheese. After a quick glance at various quince recipes I decided on a blog post recipe for quince jelly from the ever sweet and delightful Julie Goodwin. This managed to take my mind off my self-pity, at least when I was chopping, stirring, and stirring some more. I also didn’t think too far ahead with regards to the time I was starting this process. 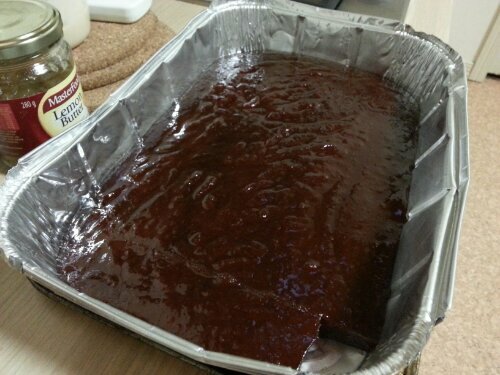 Needless to say I decided not to stay up until after midnight and instead took the sticky mixture off the heat after about 3 hours (instead of the recommended 5 hours) and poured it into a dish for it to sit overnight. After a big sleep in I checked my jelly – you can see the little corner I cut out to taste test. The mixture was still too much like jam and not set like a jelly should be so into a very low oven for a few hours it went. Now it is nice and firm and ready for tipping out and dividing into pieces for sharing. Only those who are familiar with jams and jellies will realise that I actually burnt the mixture on the stove. Otherwise it is absolutely sweet and delicious! Back to PhD agony today.